As I grew older and entered the world of professional cooking, my desire was reshaped. It was born into the depth and richness of the Middle Eastern and North African Cuisine at large… Algerian, Moroccan, Tunisian, Moorish… Traditions covered in mist of myth and centuries of recipes that go down the line… but also intrigued by the simplicity of the Spanish and Basque cuisines. My creativity is being expressed between those two points of fascination: The Middle Eastern and North African depth and richness, that is mainly based on slow cooking, spices and time… to that winning simplicity that comes with 2-3 items, lemon juice and olive oil, that the Spanish-Basque cuisine performs so well. Creativity and Innovation is my fuel. It inspires me to keep experimenting, keep evolving, to keep growing as a Chef and as a human. One of my favourite guilty pleasures is watching others eat the food I make. Observing the initial reactions of my customers and seeing when I hit a home run is deeply fulfilling. Interacting with the customers at my restaurant and working closely with my catering clients creates the main reason why I love what I do. Human connection, friendship and community with endless opportunities to touch people through their bellies, creating lasting memories. 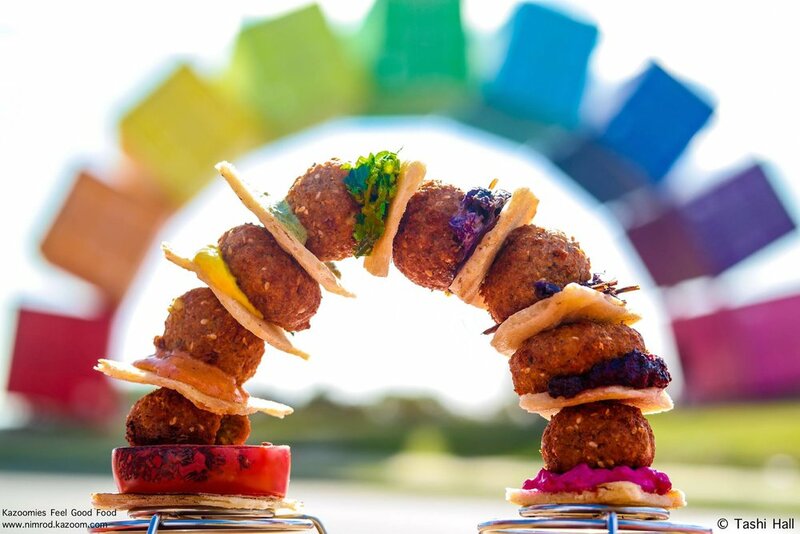 Nimrod’s Falafel Rainbow. A culinary take on the iconic ‘'Contain-bow’ at the entrance to Fremantle. In 2013 I decided to take the plunge and start creating my own way. What began as a mash up of different dreams saw me working as a cooking teacher, caterer, culinary concept consultant and running regular food market stalls. It wasn’t long before the demand gave me a direction I couldn’t refuse and I opened my own restaurant, Kazoomies - Feel Good Food, in Fremantle in 2015 as my Catering continued to grow. Since then it has been a roller coaster of the unexpected. Firstly the inevitable shock of how difficult it is to run a restaurant, to how fulfilling it is to be able to tell my story and the story of others through food. The surprise of being voted the Best Breakfast in Perth and reaching the number 1 spot on Trip Advisor followed by the surreal awe of winning the Excellence in Hospitality Award at the Fremantle Chamber of Commerce Business Awards. With all the blood, sweat and tears between. What a ride! As the business continues to grow and evolve I am so thankful for those that have supported, guided, trusted in and worked beside me. I am eternally grateful for the opportunities that have allowed me to live my dream and create a home here in Australia, and for the chance to make a home for my team and for my customers.